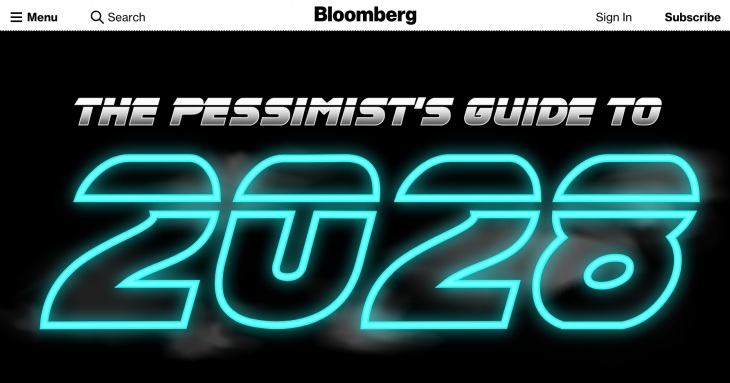 Jeremy Scott Diamond, a developer and designer for Bloomberg graphics, helped create last December’s “Pessimist’s Guide to 2018,” a recurring piece designed to give users a look into the future. 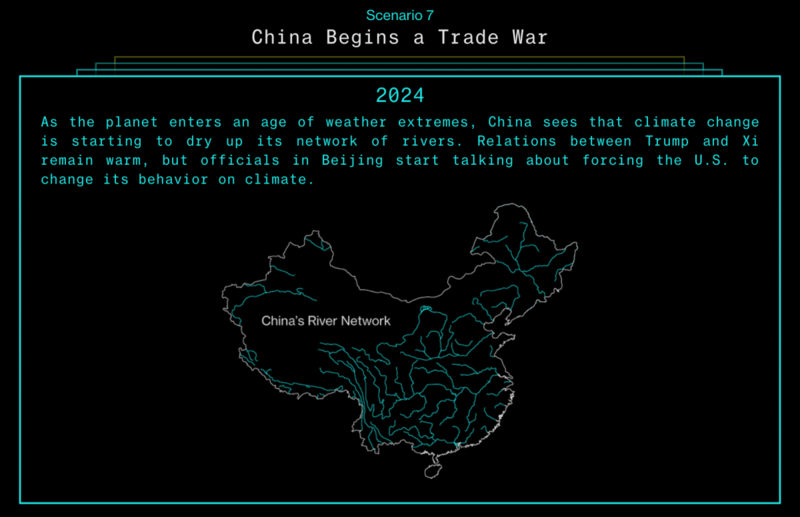 Based on the top-trending news articles from the previous year, the project gives readers possible scenarios that could play out nationally and globally. Storybench sat down with Diamond to discuss how the project was envisioned and created, and what journalism students can learn from his techniques. When you were first developing this with your team, what exactly did you want your project to achieve? What sort of tools did you use to develop the projections, what did you use to develop the S&P 500 Index and the projected military spending in the first scenario? We made it very clear that the projections were, here is actual data and then the projections are shooting off a laser beam affect. We talked to the experts. They are not based off models or trying to simulate. It’s just giving you a rough estimation. Since this is all hypothetical, we don’t expect anyone to look at this and say, ‘Oh, okay I could make some market choices, you know, buying things based on that or this.’ We didn’t feel the need to be as rigorous with the data as we might be if we were trying to actually show projections. How did your team pitch this project to the editors at Bloomberg? John kind of thought it up and then circled around with Flavia Kraus-Jackson [Political Editor, U.K] and Anne Swardson. Flavia is in London and Anne is out of the Paris office, and just brainstormed with them a bit about what could this be, and then it came to us. We get stories through all different means but this one actually originated with the editors. I know this is all hypothetical, but some of the scenarios are a bit frightening. Was there any hesitation before publishing this? They are meant to be things that aren’t totally out of the realm of reality. I don’t recall there being any particular scenario they stopped and said, ‘Maybe we shouldn’t say this.’ It was kind of within kind of scary but not too far out there. I think it is still a bit strange and I think these don’t take the normal story form, just because we want to make sure that, you know, this is not a normal story, it’s about hypotheticals, so we do the design work to kind of make it feel that much different, so we feel more comfortable with what we’re saying because it is kind of a separated realm. What did data visualization and design bring to the story? I think what the data visualization brings to it is this grounding in reality, saying, ‘Okay, this is some real data, this is some projected data.’ Once you see it charted, or once you see it mapped, or once you see a kind of photo-illustration of this thing happening, it makes it feel a bit more real—it makes it feel like it’s got some background in historical happenings or some kind of basis. I think, in this particular case, the visualizations are meant to say, you know, here is the lead in and here is the projection, or fallout, afterwards. It makes it a bit more tangible. Do you have any advice for journalists or journalism students who want to create a project like this? I think convincing editors or whoever it may be to get it into stories is a matter of the ease of technology, which seems to be more of the hurdle than convincing people that the graphics are good. I think there’s a few arguments that can be made a bit better if you have some kind of proof, and one of those bits of proof could be coming from data, coming from a historical view, or a comparison to other entities, and as long as your sourcing is getting done correctly. If your data is good and the form that it is in reads nicely than I think that kind of speaks for itself.